The beautiful Loelia, Duchess of Westminster, wearing her Art Deco diamond halo tiara. Photographed by Cecil Beaton. OK, this sounds like a real first world problem… it is not a dilemma the majority of us mere mortals are going to face any time soon. Some girls are lucky enough to wear a real diamond tiara once, on their wedding day. And a tiny minority of unicorn dusted people have to wear one on a regular basis. It is astonishing how, with all the money and fashion advice they have at their disposal how wrong they get it and how bad it looks. To my jeweller’s eye it is like a bias cut dress worn in the wrong size, or open toe shoes without a manicure. First, a bit of history… the heyday of the tiara was in the late 19th and early 20th centuries. 120 years ago (give or take a few) the vast majority of women wore their hair long. When you married, your hair went ‘up’- and the crowning glory was the tiara. This is how the convention arose that unmarried girls did not wear tiaras. It was a convention followed by the Queen- the first time she wore one was on her wedding day. The majority of the most beautiful, accomplished tiaras were made for Edwardian women, designed to be worn in clouds of hair, often augmented by hairpieces. The frames and velvet bands of tiaras were therefore made for these sorts of hairstyles. A tiara is not an Alice band or a headband- it is not supposed to hold the hair in place- the jewel is supposed to be held in place by the hair. A young and as yet unfashionable Princess Diana, wearing the Spencer tiara. Princess Diana develops a fashion sense and good hair: wearing the Cambridge Lover's Knot tiara, a present from the Queen. To achieve the most elegant look, the hair needs to be pulled and stranded over the velvet headband to secure it in place. The front of the hair should then be backcombed, teased and arranged in front of the tiara. It is a skill that very few hairdressers have nowadays- there is, after all, very little demand for this service. And of course, any Edwardian lady (who after all would probably wear a tiara at least once a week) would have employed a ladies’ maid trained with this invaluable skill. But some of the younger Royals who looked like they’ve plonked their heirlooms on their heads as an afterthought should take a leaf from their more experienced in-laws. Some of the Scandinavian Royals are the worst offenders and even top drawer Royals, like Queen Letizia of Spain, don’t always get it right. Princess Madeleine of Sweden is rocking the high school prom queen in this example of how a diamond tiara can look so wrong. Princess Madeleine looking dignified with this aquamarine and diamond family heirloom tiara. Princess Diana conquered the tiara with aplomb (as she did most fashion accessories). Early photographs of her as Princess of Wales show her with limp, mousy hair, frame and velvet band on show. As she became more assured and soignee, she learnt to style her short hair around her tiaras, proving (as the Queen does all the time) that you don’t need a lionine mane of hair to achieve a good, modern look with what is essentially a 19th century accessory. Queen Letizia of Spain, looking almost top heavy in her Ansorena diamond tiara. 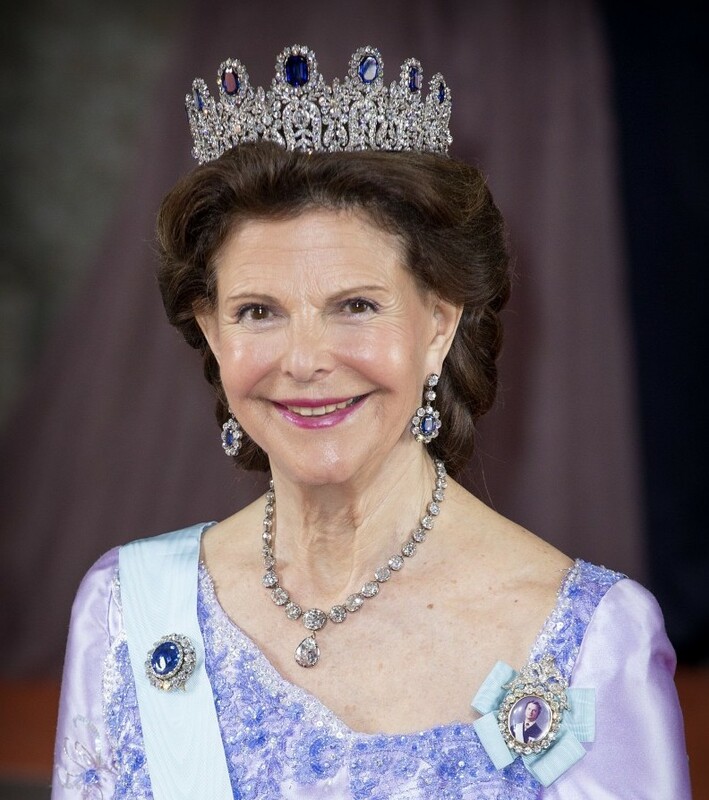 The older generation of royals, like Queen Sylvia of Sweden, always seem to get it right when it comes to tiaras. Part of the problem with wearing a tiara (or diadem) on flat hair is that it makes the jewel look too big for the wearer’s head. You only need to look at some pictures of continental Royals wearing these pieces with what they believe is a slick side parting and you realise that the proportions are all wrong and they look top heavy. A lot of them look like Queen Victoria circa 1850. So, Meghan, listen to your future stepmother-in-law for advice, who seems to have taken to wearing a tiara like a duck to water- and run a mile if the Countess of Wessex tries to tell you what to do with your hair. An immaculately groomed Duchess of Cornwall wearing the Greville Boucheron tiara. The Countess of Wessex wearing her diamond wedding tiara.